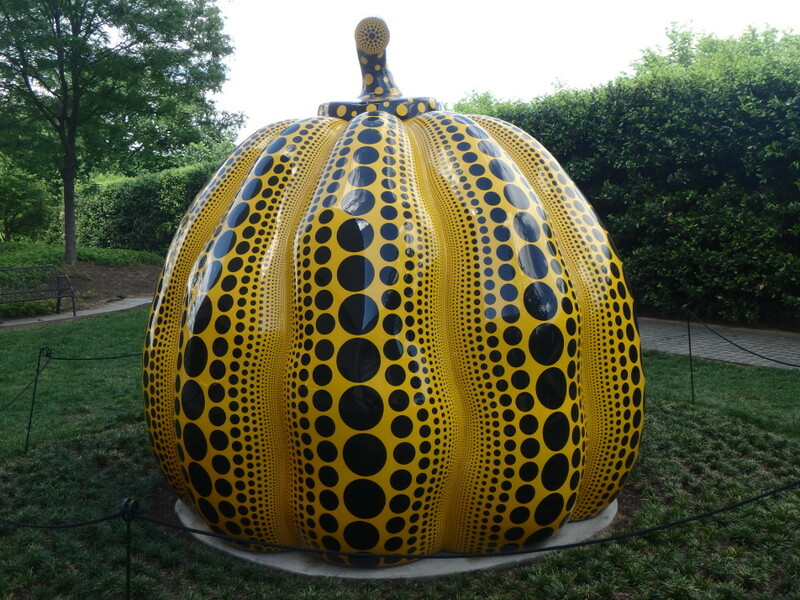 The art event of the year was the Yayoi Kusama exhibit at the Hirshhorn Museum. 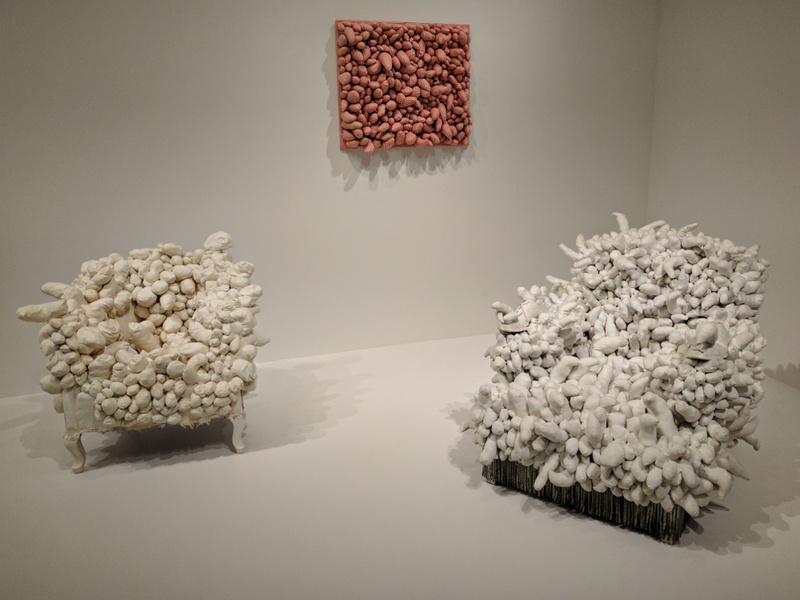 While a few art connoisseurs out there know exactly who this artist is, the rest of us have simply picked up on the buzz about this exhibit from its “Instagram-worthy” reputation to the rapid ticket sales and long lines. 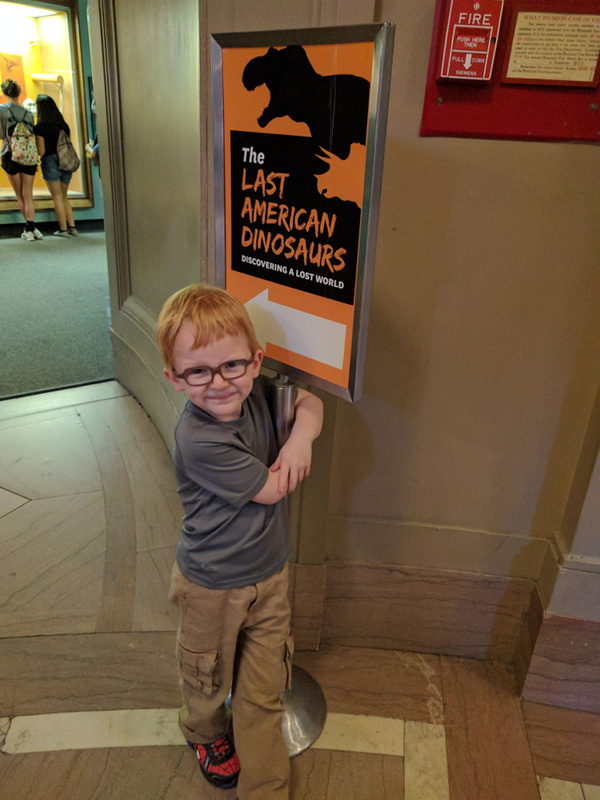 Despite all the warnings about how tickets were not guaranteed, how the lines would be long and that there would be no place to sit down, I packed up my kids early one Tuesday morning and we went to attempt the show anyway! 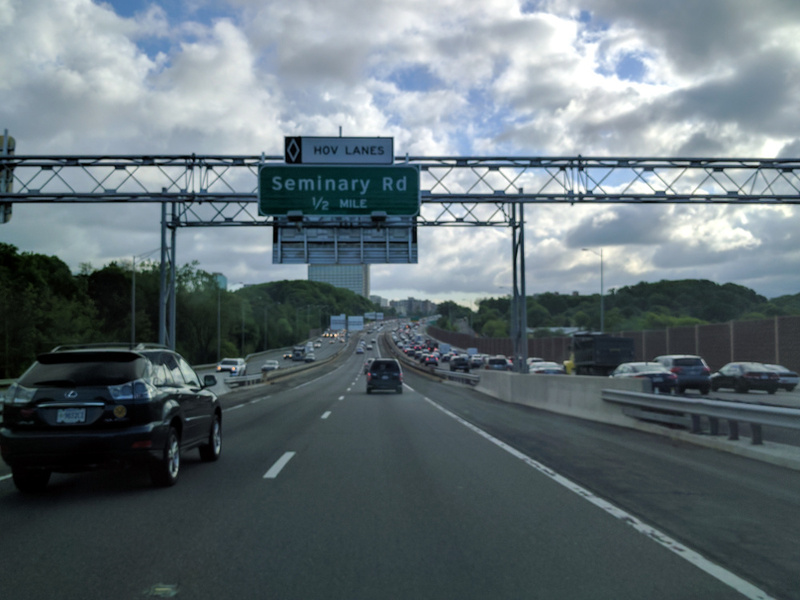 We left the house around 6:30 a.m. and with slightly heavy traffic into DC that day, we parked and were standing in line about 9:00 a.m. People were chatting that the process for getting tickets to this event was even worse than getting Adele concert tickets! A woman in her 50’s behind us was doing her daily Snapchat in line. 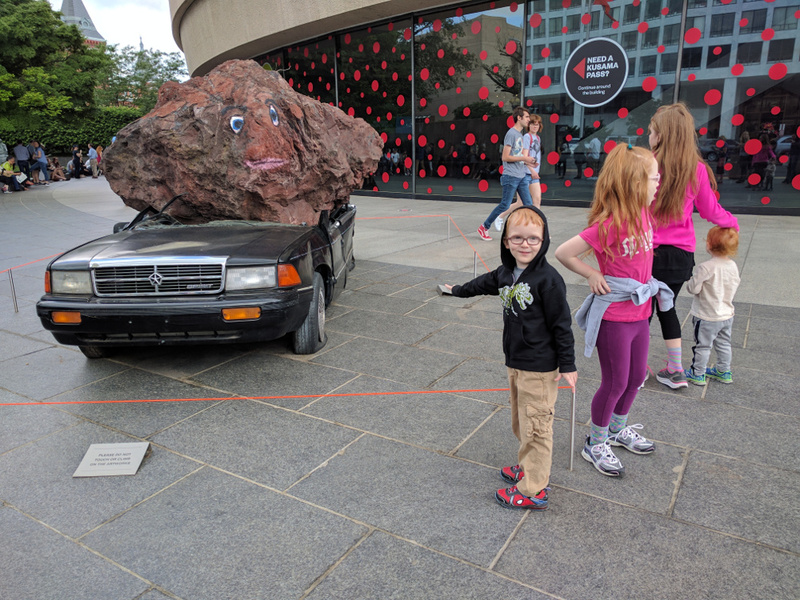 We started off standing in line at the front of the building near this car sculpture which my boys thought was the best ever! The line we were standing in snaked into another endless line. About 9:00 a.m., a school group of elementary aged children pulled up in a school bus and went right inside the museum. Around 9:30 the line started moving. While I waited, the kids played on the grass in the nearby courtyard, checking in to see me whenever the line moved significantly. At one point, the line progressed into a spiral of retractable belt barriers. The kids were then stuck with me in this tight spiral to the ticket line. Parts of the line smelled like a sewer! We thought it might be bird poop in the fountain but then realized the nearby portable bathrooms were likely to blame. Amazingly, still in good spirits at this point! 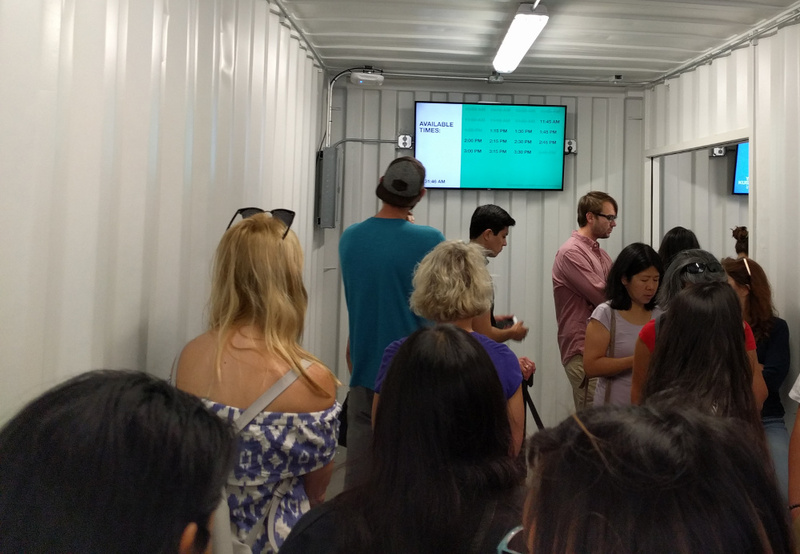 The last part of the line winds into two shipping containers (for unknown reasons). There is an electronic screen telling you how many tickets are left and they were disappearing rapidly. By this point, my youngest son was ready to bolt out of the container. We held onto him tightly as losing our place in line at this point would be devastating! Finally, we made our way into the museum doors. 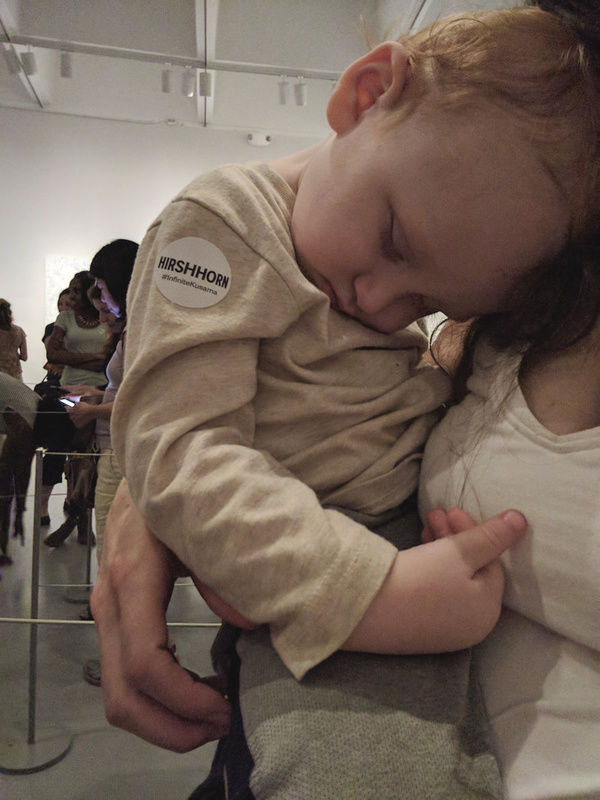 A museum worker was passing out tickets. 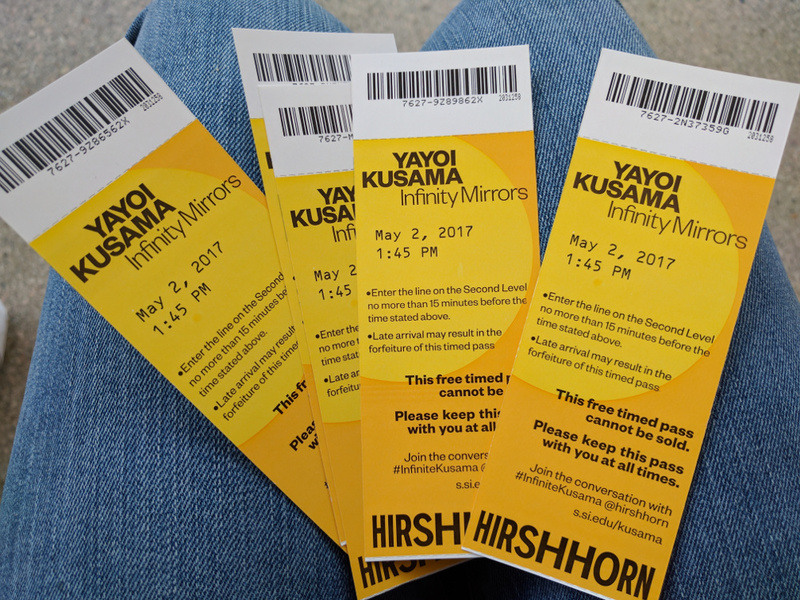 While we thought you could perhaps choose from the remaining ticket times, instead a harried museum worker was passing them out in a “take this time or forget it” fashion. We happened to snag the last 5 tickets for 1:45. It was such a relief to finally have these in hand! 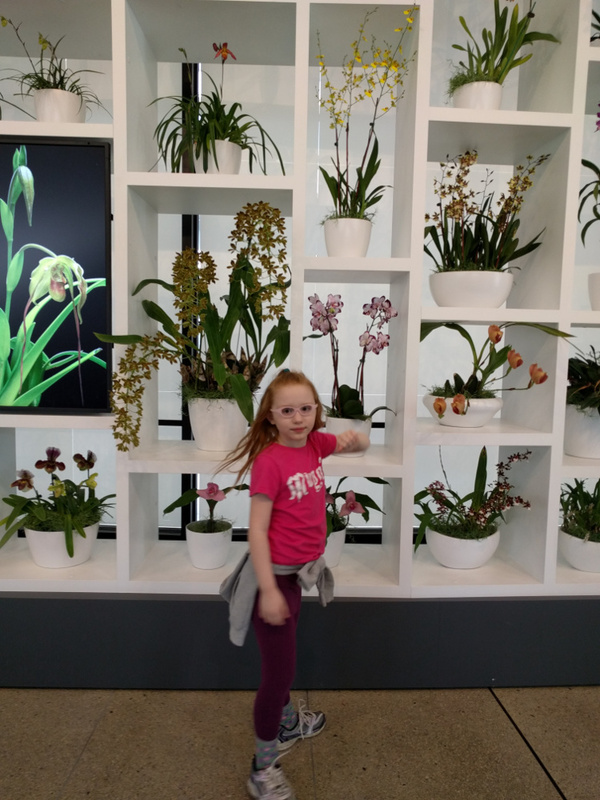 We briefly admired the orchid exhibit on display then went to sit down for a minute in the lobby. A mother came by with her young toddler….”Do you have any extra tickets? I just missed the line by 3 minutes.” I commiserated but unfortunately had none to share. About 30 minutes after we got our tickets, the event was totally sold out. Enjoying the display of orchids. They took up the entire wall! While waiting in line, we saw staff come in and replace some of the orchids to freshen the exhibit. At this point, we still had several hours to kill until our exhibit entrance time. 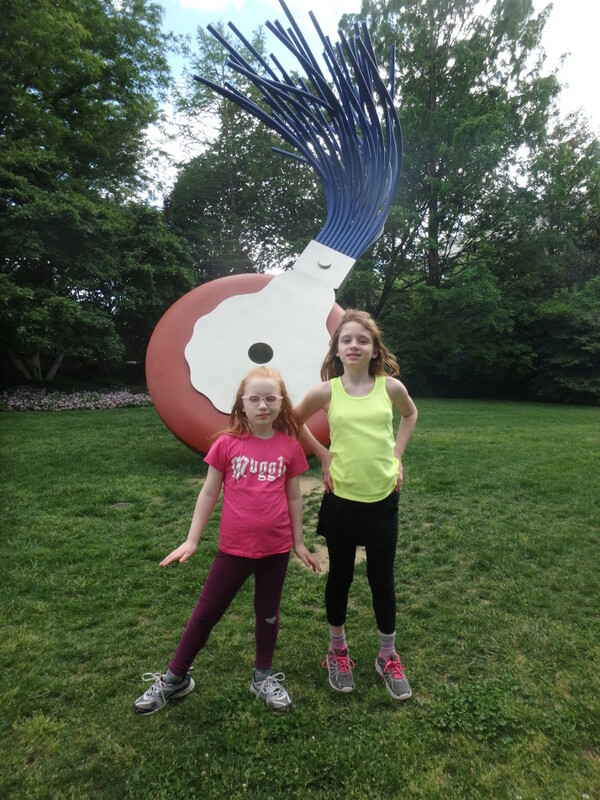 We walked back to the car to get the extra camera in case my cell phone battery died in the exhibit (which of course it did!) and got some lunch at the Natural History Museum. 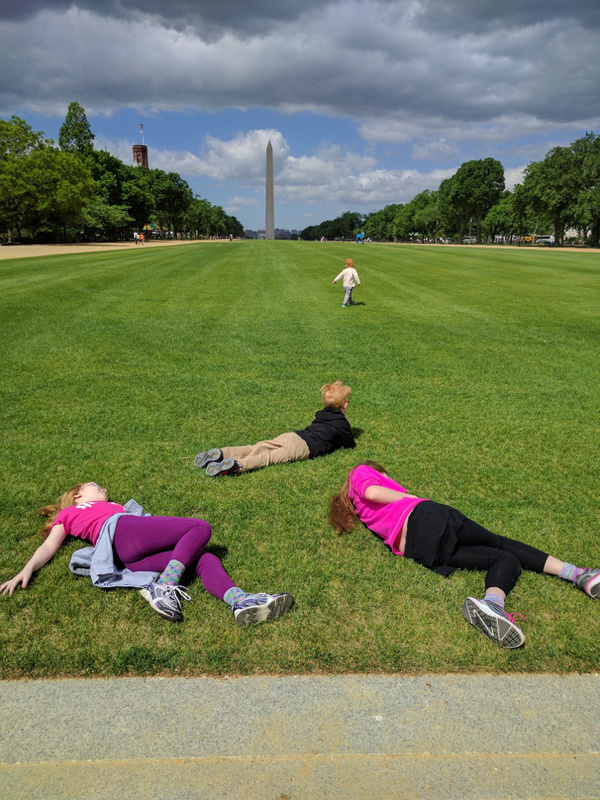 The kids were pretty exhausted by this point….well, except for one! 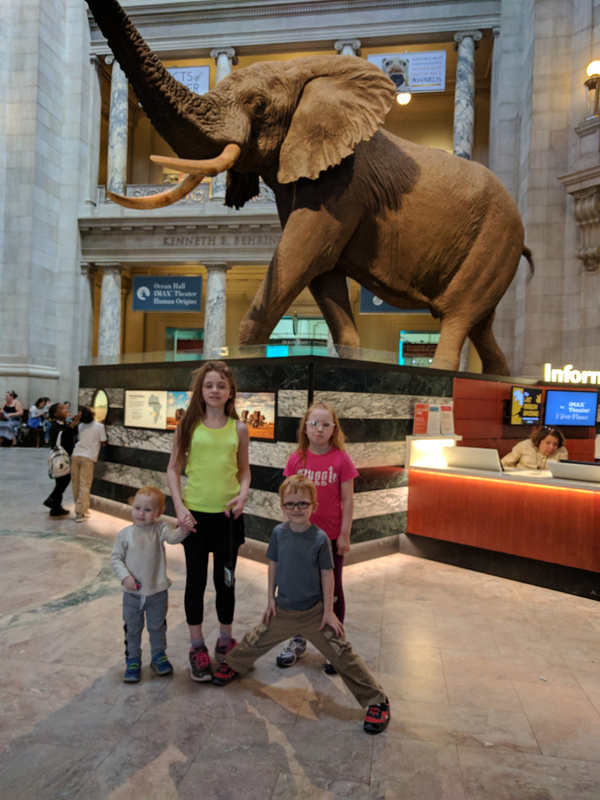 My little guy loved the iconic elephant in the lobby! Lunch was OK and expensive. The best part per the kids was the cupcakes! 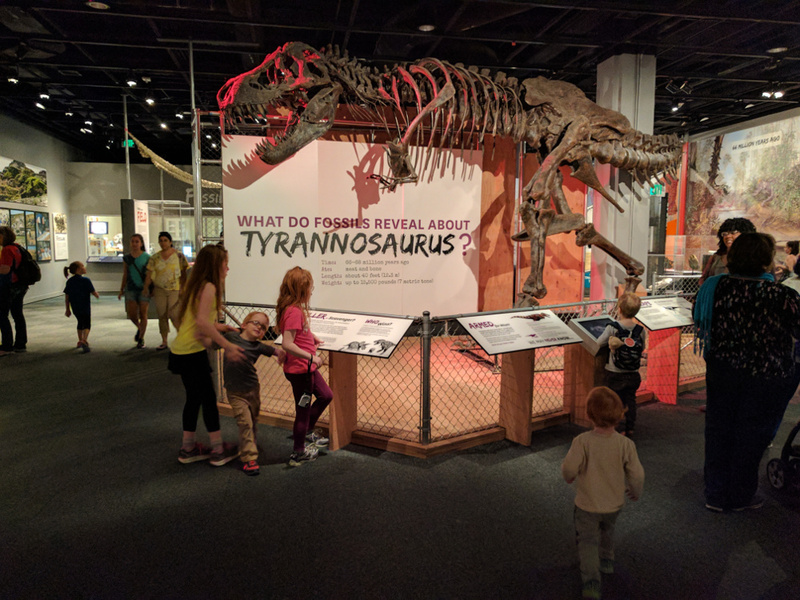 Unfortunately, the dinosaur exhibit is still being updated. There were two big dinos on display with a bunch of smaller computerized exhibits. It looks like more is coming in a few years. 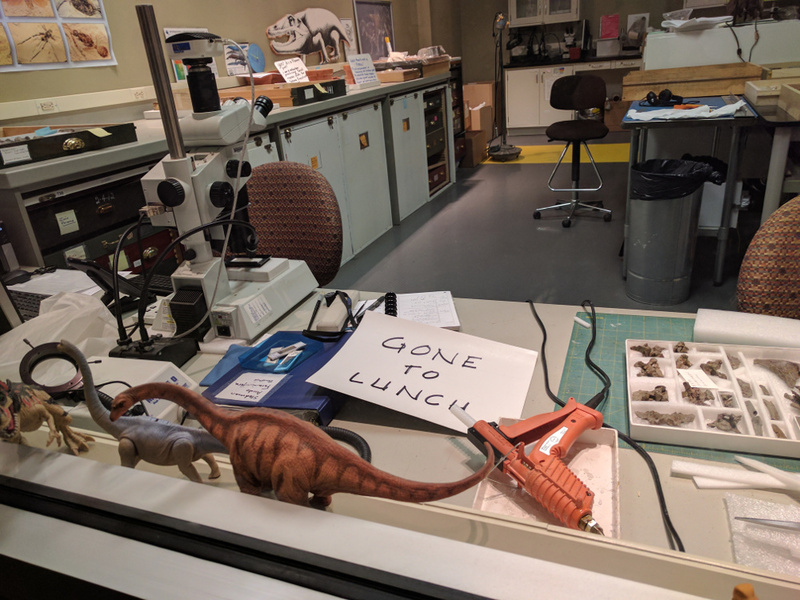 The scientists working on processing dinosaur bones were gone for the moment and left this memorable sign. 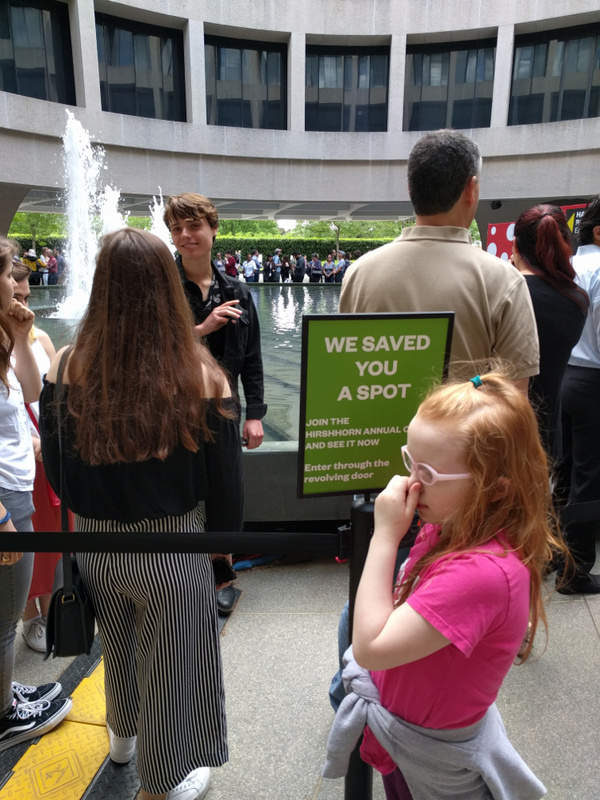 I don’t think the museum expected that some visitors might want to actually step back in time, right into the exhibit! 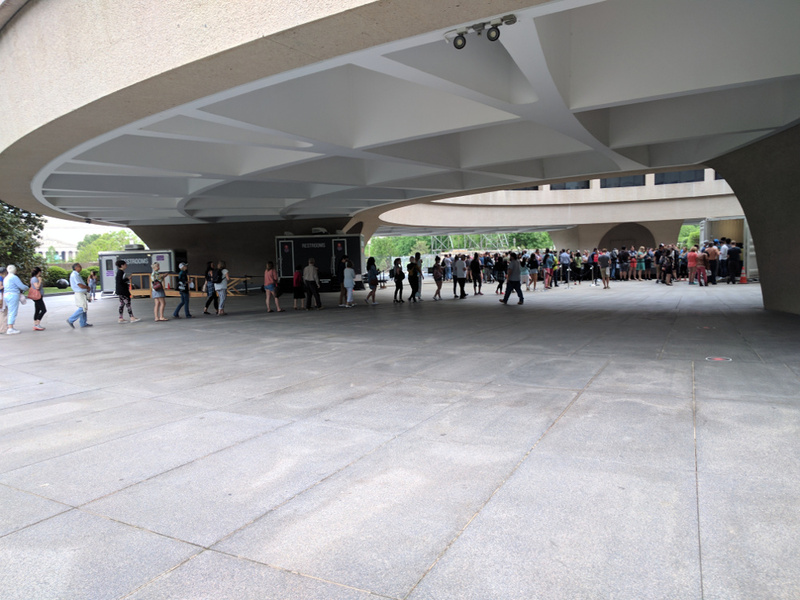 We had just enough time to walk back to the Hirshhorn for our ticket entrance time! 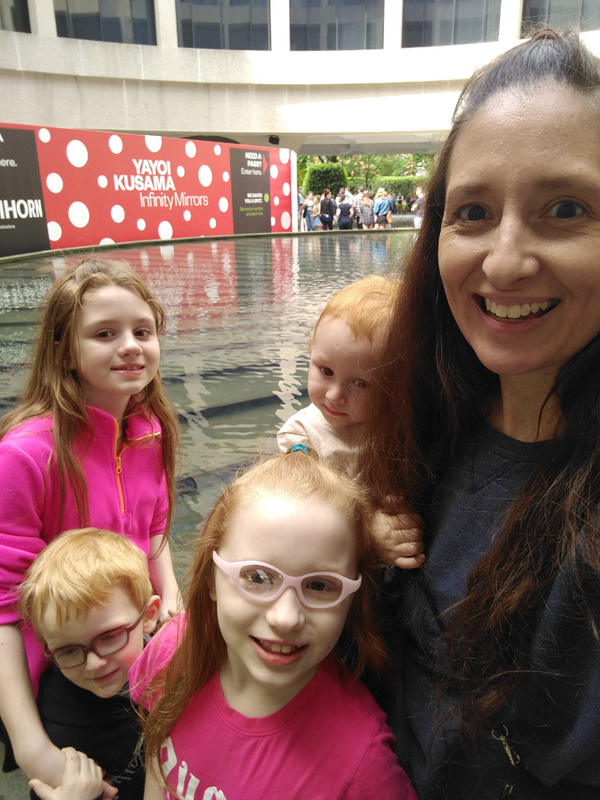 With four children in tow, I had no time to linger over descriptions or introductory material. I had to grab whatever brief information I could as we passed through the exhibit. There was an introductory video featuring Kusama herself. I got to see maybe 20 seconds of it. 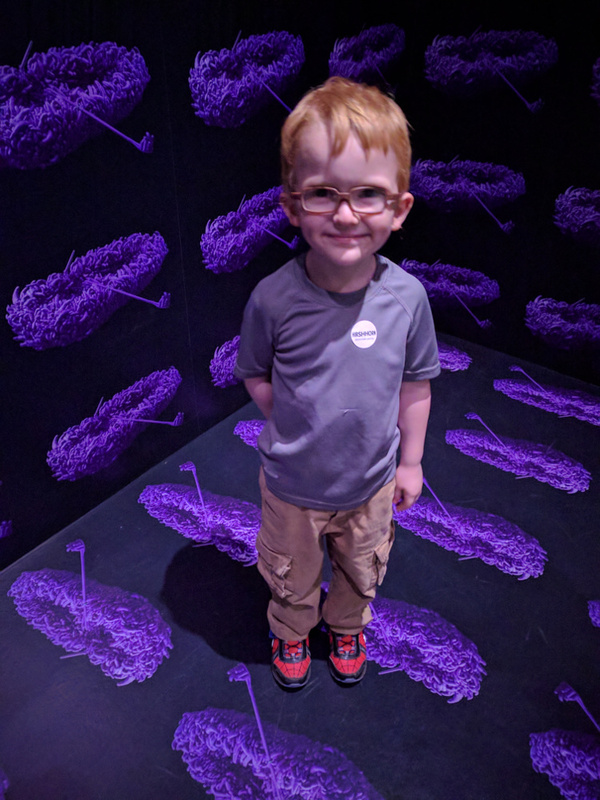 The exhibition opened in a black room with a large purple boat in it. The boat was covered with various purple stuffed objects. I learned later that this was her “phallus” phase where she was creating phallus-shaped objects in part as a way to cope with sexual abuse she had experienced as a child. 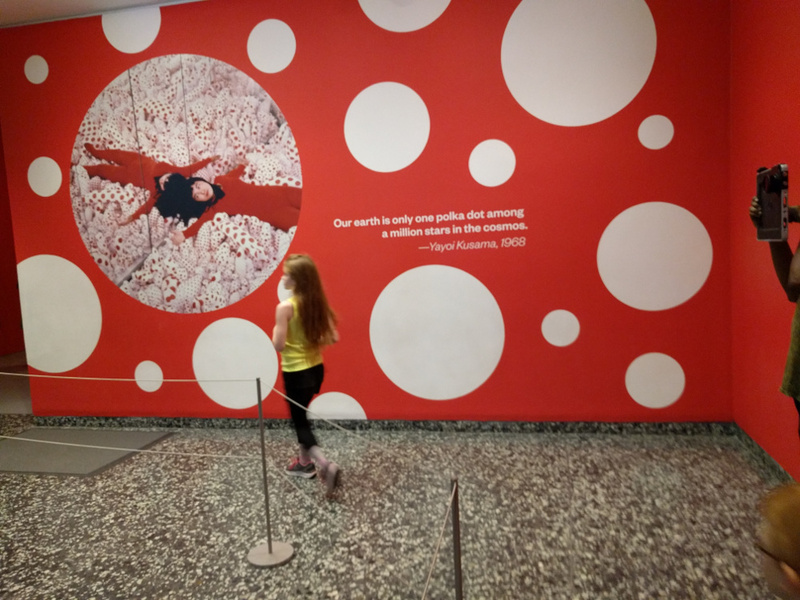 From what I understood, she began exploring polka dots as a way to contemplate her own position within the universe. The repetitive motion of the dots might have been calming but also a reminder of how small and insignificant any one dot is. 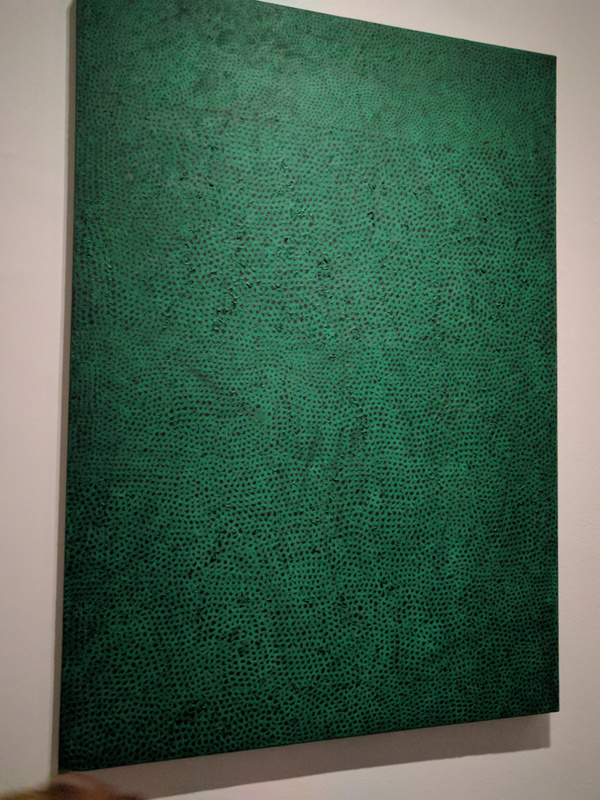 Another early work which I believe was called “snake skin” where she covered the entire canvas in small dots. 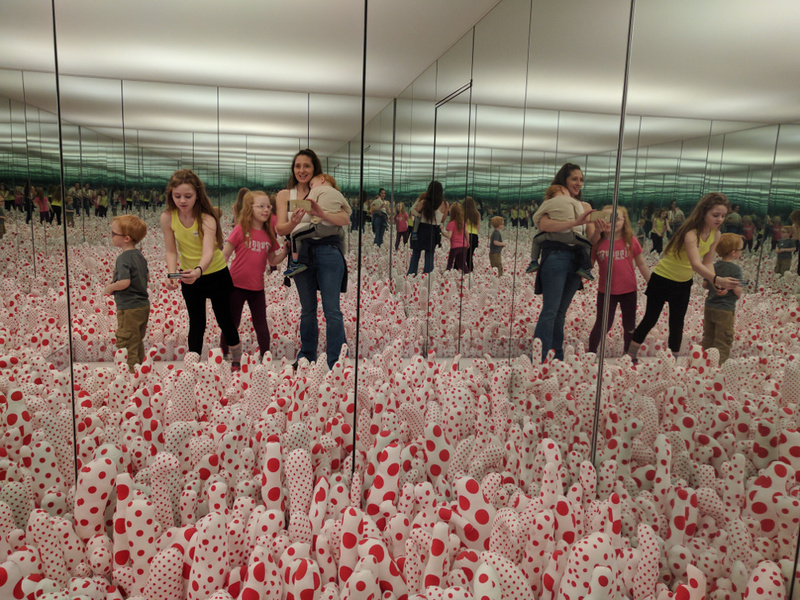 We reached the first of the “Infinity Rooms.” These are white box enclosures that seemed to be about 15 feet by 15 feet by 8 feet tall. There is a really long line to enter each one. The first room was called “Phallus Field” and was her first work in this genre. Initially she had spent about 3 years sewing phallus-shaped objects to distribute over the floor of a large space. Later, she realized that she didn’t have to sew as many if she used mirrors to make the visual repetition for her. Who could not find this a stimulating visual delight! 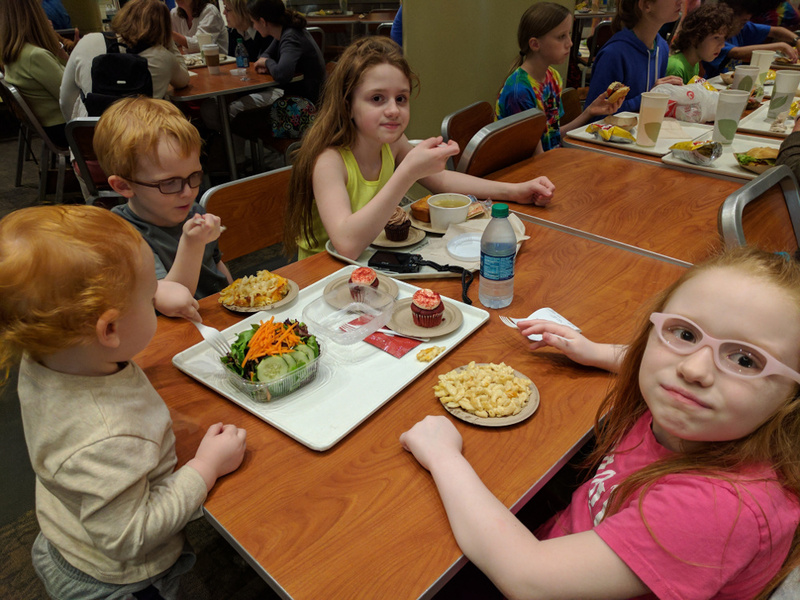 After we had our 30 seconds, I said, “Wasn’t that awesome!” The kids said it was “OK.” When I told them we had to wait in line for more of these, they were so disappointed! 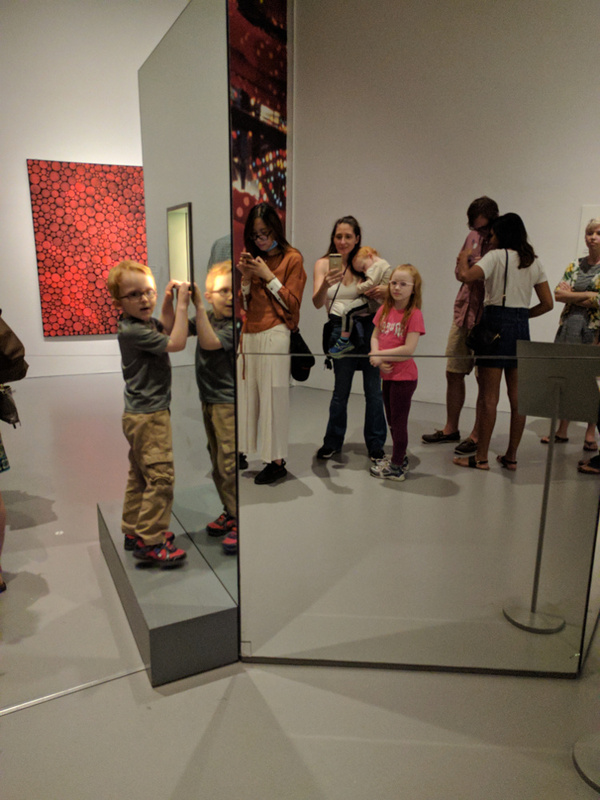 Fortunately, the next room was a mirrored glass box with almost no line! You just quickly stepped up, took a look inside (and a selfie if you wish). The piece reflects your face in the mirrors as well as the face of the other person peeking in the other side. My son peeking in the box. The line for the next room reflected in the mirror. The visual light display you see inside. I got very lucky that my 2 year old fell asleep at this point. Trying to control him in all these lines would have been a challenge. 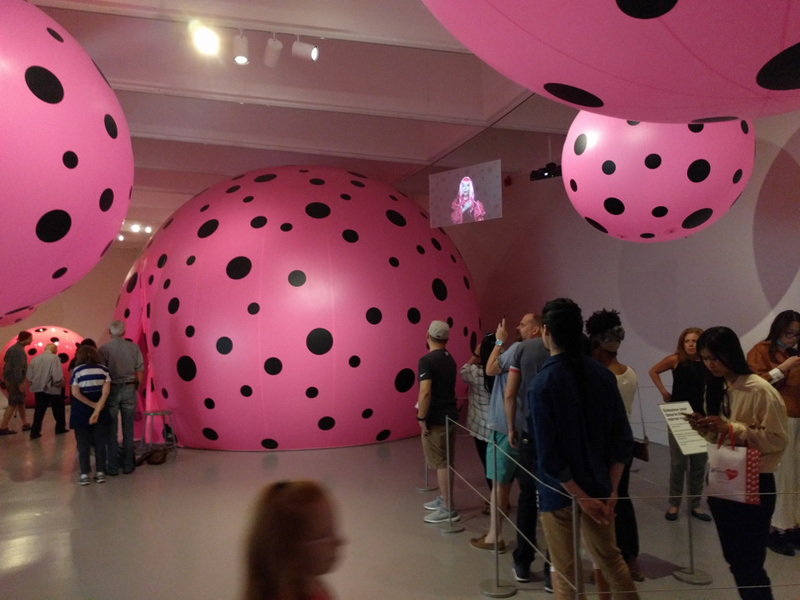 The next room was full of pink and black polka-dotted orbs. 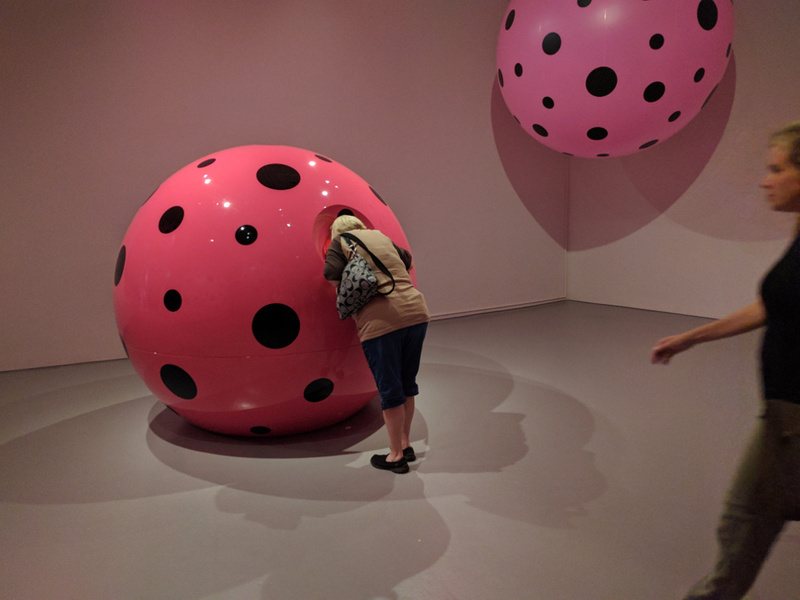 The pink orb room. The center orb is an inflatable room! Inside the orb room. 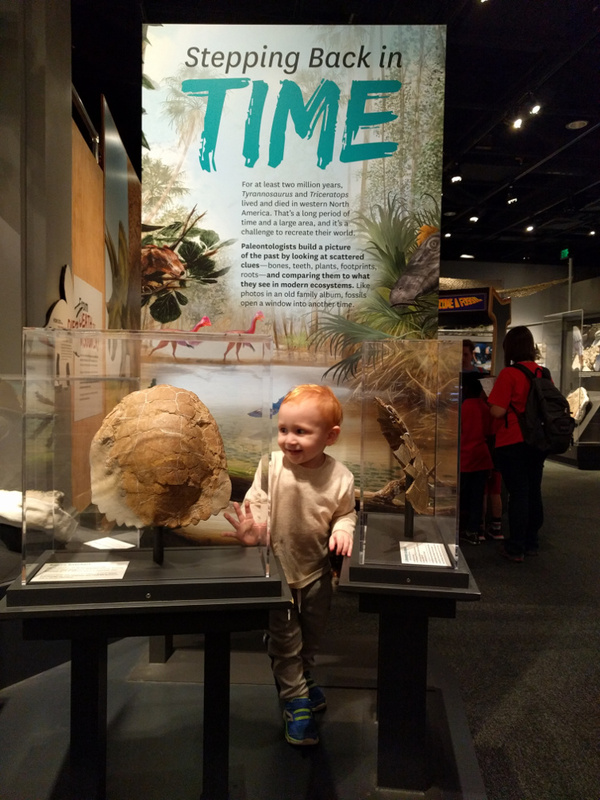 My littlest son woke up briefly at this point and said, “Balls!” and grabbed to hold on to one of them. Fortunately, we stopped him in time. The next “room” was a chance to peek inside this huge orb. I love where the artist positioned the viewing hole. 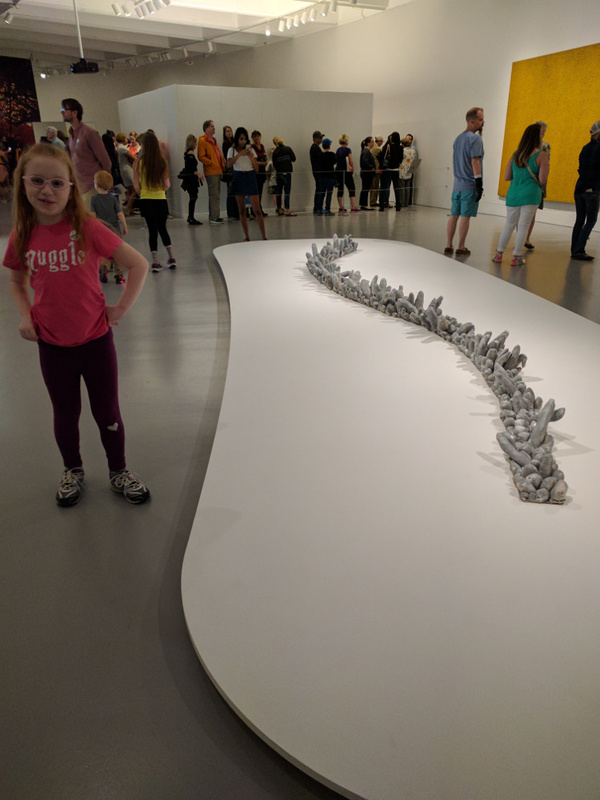 It makes the people viewing the art look ridiculous but that became part of the artwork. 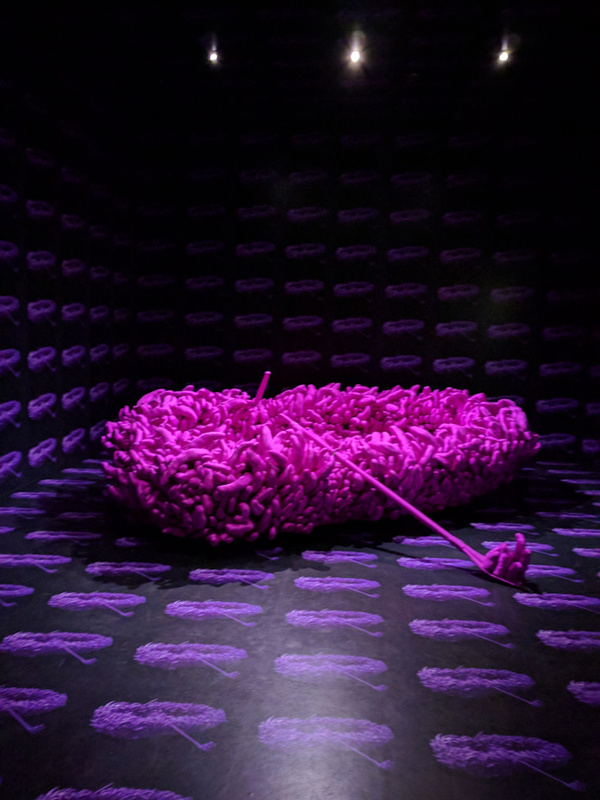 The view inside….a pink amoeba paradise. This floor full of snake-like objects would be a toddler paradise to run through and touch. By this point, it has probably been close to 2 hours and had yet more lines to wait in for the remaining rooms. The kids staked out one of the few available couches for a nap. 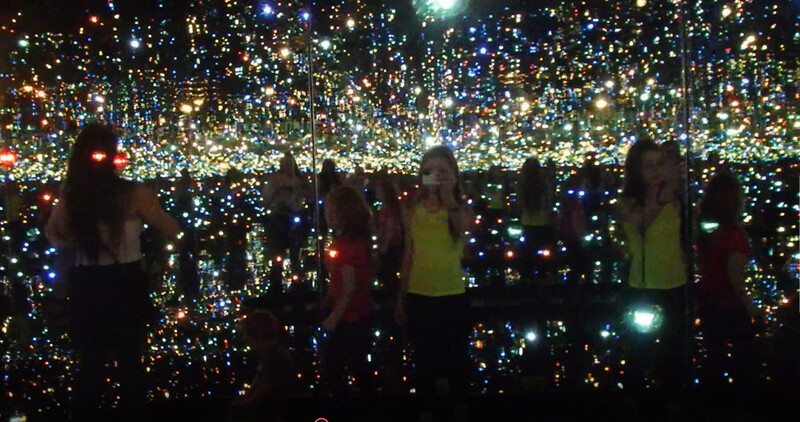 Inside another “Infinity Room.” This one makes you feel like you are in the universe. 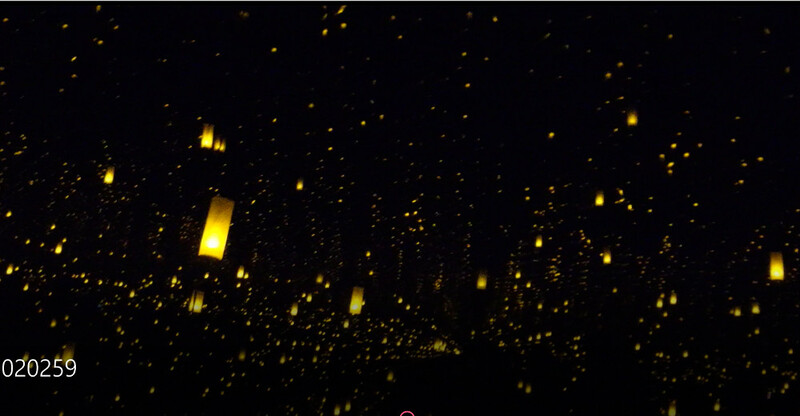 Inside another very dark infinity room. This one looked like small lanterns. 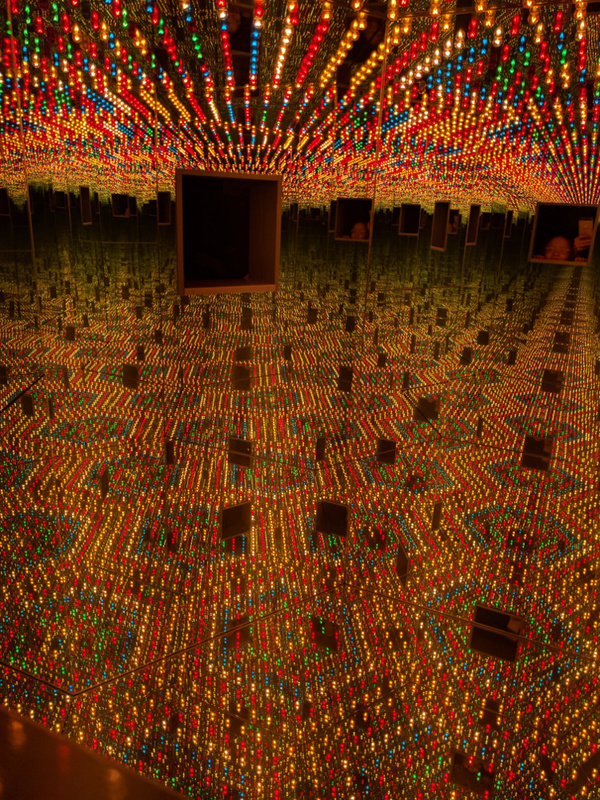 The final infinity room was the pumpkin one. It was full of small glass polka dot pumpkins. 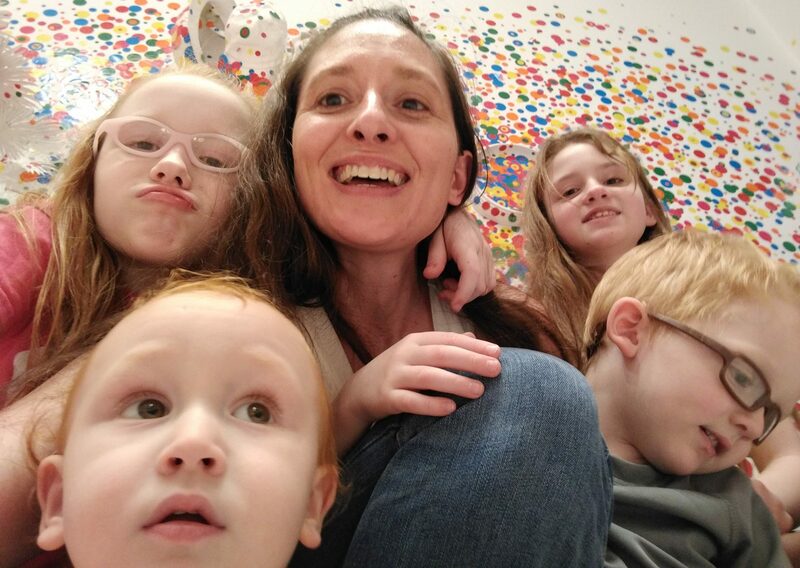 Unfortunately, due to an earlier mishap at the museum, when an overenthusiastic selfie seeker tripped, fell and broke(!) a pumpkin, no one was allowed to take any photos inside this room. This was the only room where they did not allow all 5 of us to enter at once and a museum staffer had to come with us. Finally, we reached the last room of the exhibit. The room is filled exclusively with white items, white walls, white furniture, a white piano, etc. 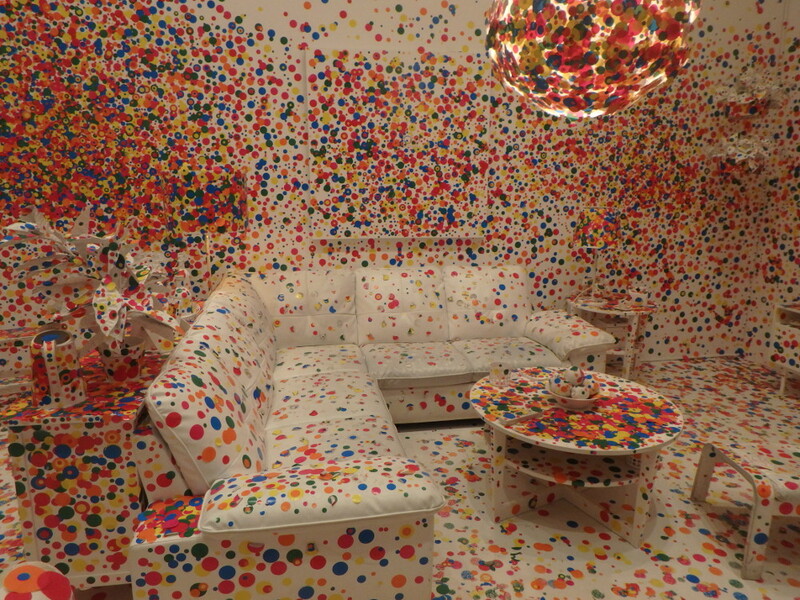 As you enter the room, you are given polka dot stickers to place anywhere in the room. 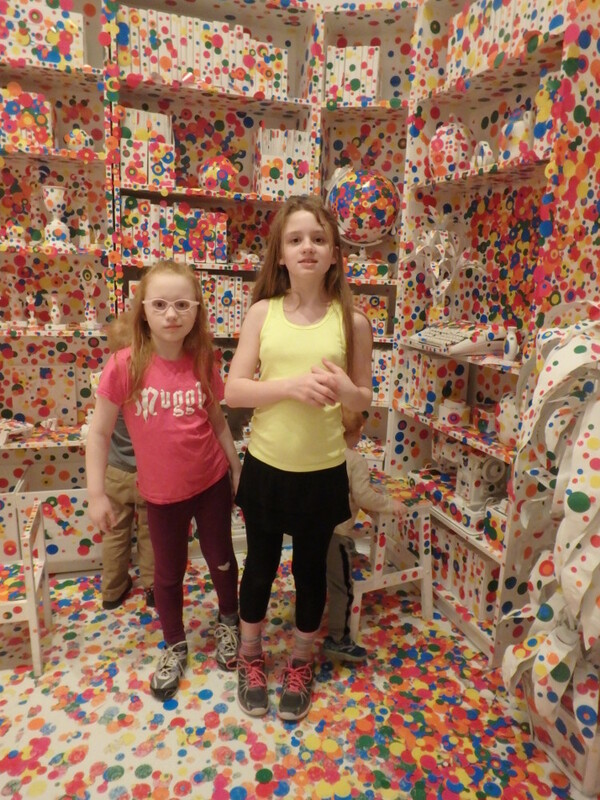 The room was already fairly thoroughly coated in dots but we managed to squeeze in a few. The kids were absolutely worn out by this point. They were so glad to get outside and run off some pent up energy. I promised a snack and we found a good one! After all that art, it was time to find a snack. 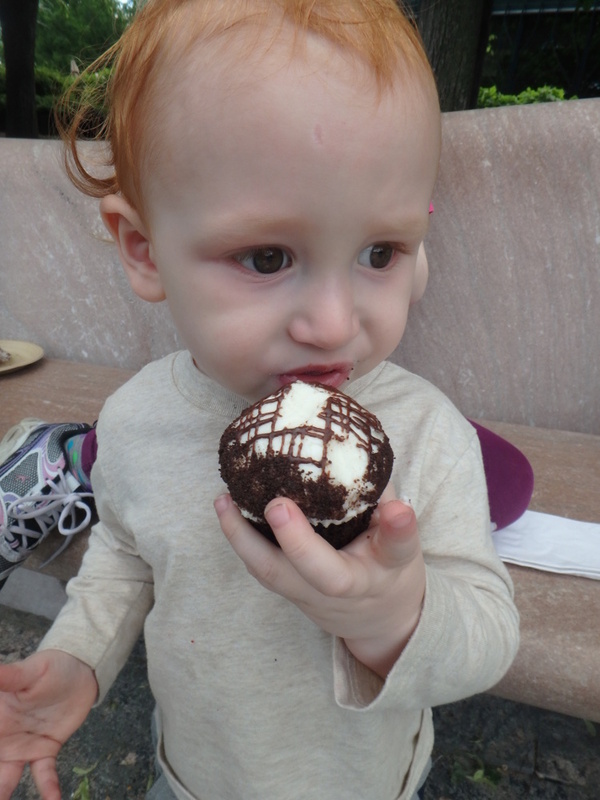 Some of the best cupcakes at the Smithsonian are in the Sculpture Garden Cafe which was just about to close but a kind security guard and cafe worker let us in for a last-minute treat! One of those “mom” photos. Recreating a shot from years ago with these sisters. Overall, the exhibit was wonderful! It would have been so much better if there weren’t so many lines and standing around but we were glad to be able to experience it regardless. It is a testament to how much my children must love me that they survived this almost 11 hour(!) 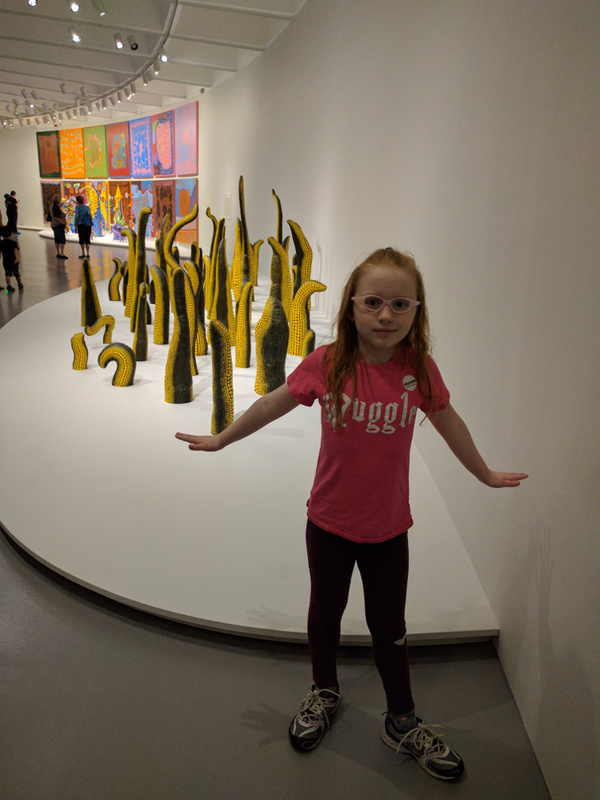 art experience with relatively little fuss. I wondered why this particular art exhibit had achieved rock star status when there have been so many great shows before. 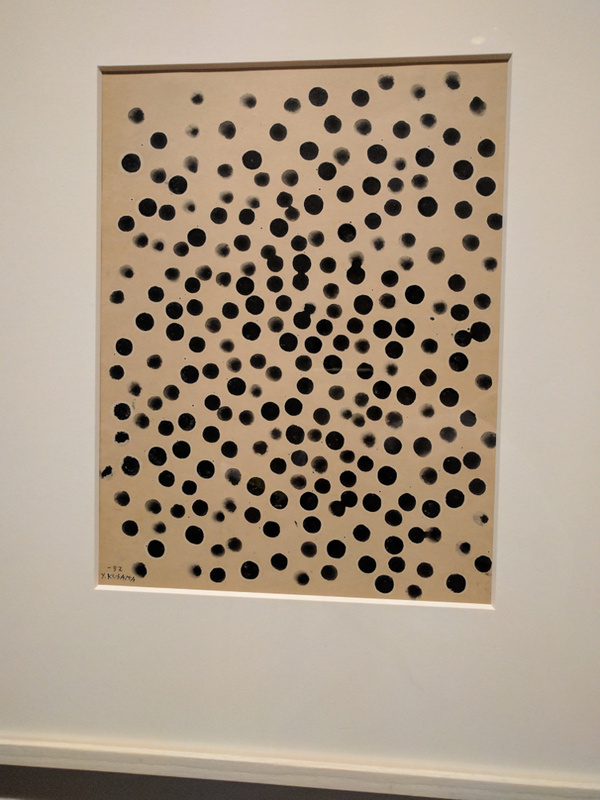 I think it has to do with the simplicity of Kusama’s work. 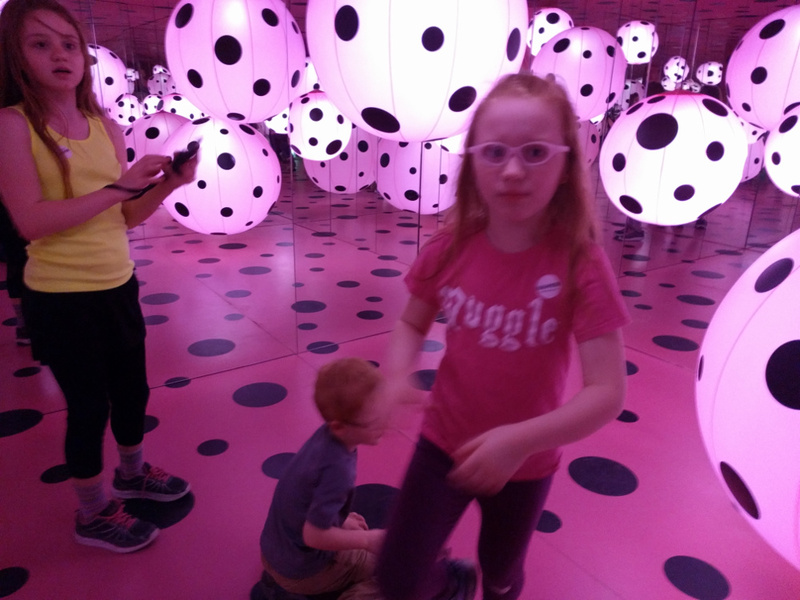 You don’t have to be an art expert to understand polka dots or be moved by seeing endless reflections in a mirror. There was also a layer of depth within the simplicity. 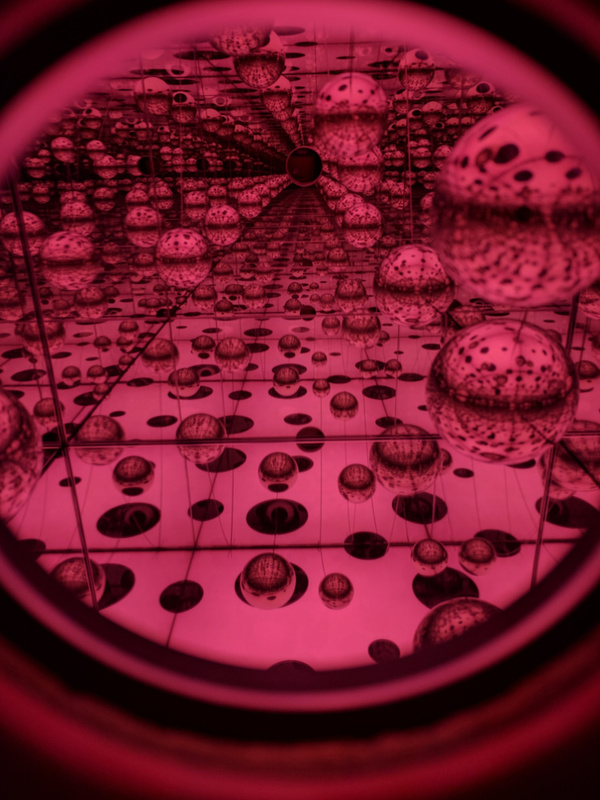 With her dots, Kusama does take the mind on a journey to the stars. Her work has a global poignancy. It is wonderful to see so many people get so excited about art! 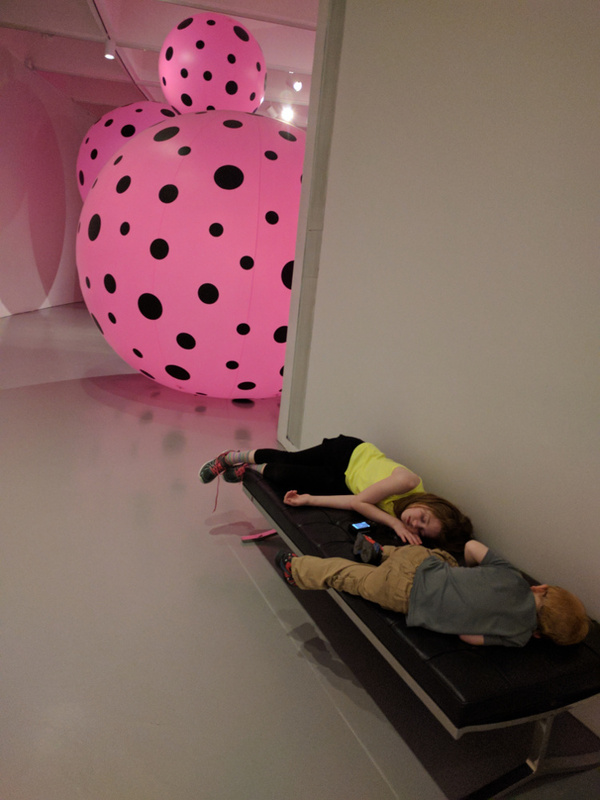 I was amazed that my own children were impacted by Kusama’s work. 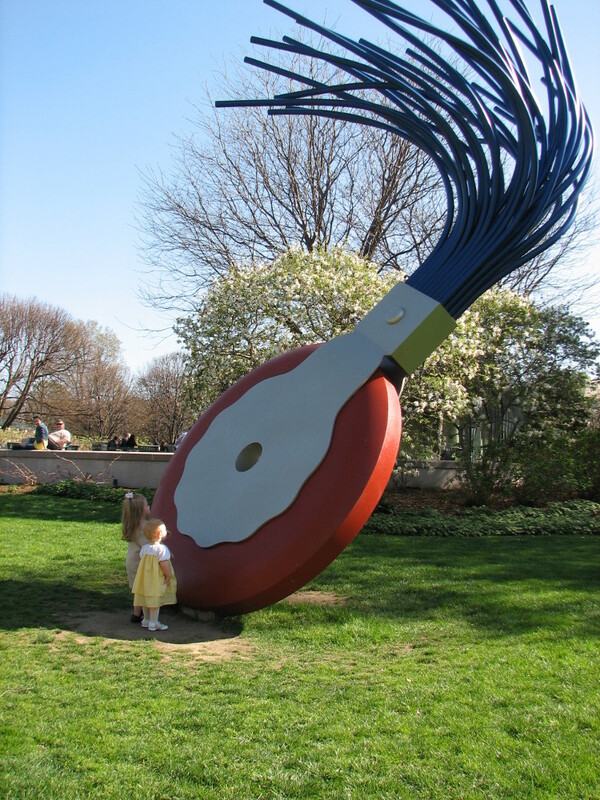 Of the many art exhibits we have been to, this is the first one where they remembered the artist’s name! They have talked about this experience on several occasions since. 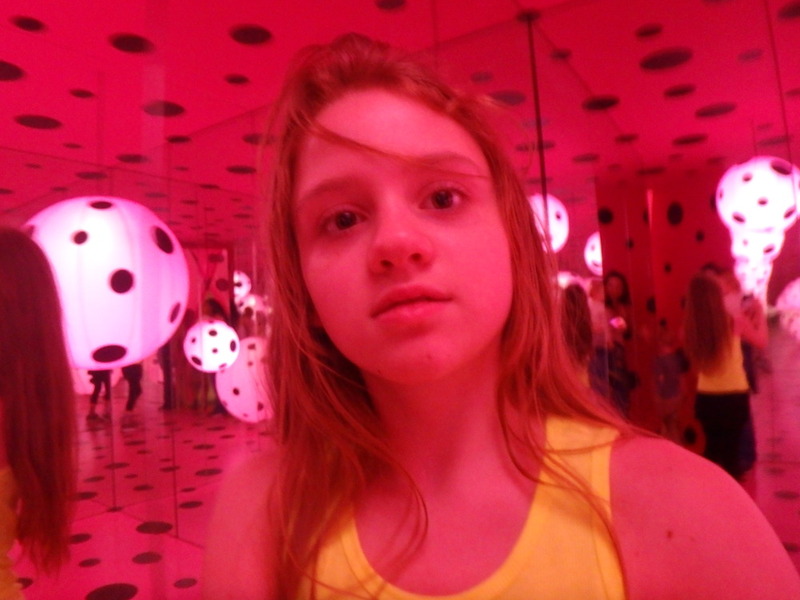 My amazing children, I love you more than you will ever know, more than all the polka dots in the Kusama exhibit!